The Arturo Fuente Gran Reserva is the Fuente family's flagship series and represents four generations of family tradition. 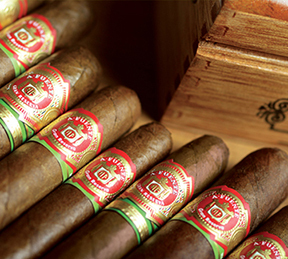 Made in the Dominican Republic, only the highest quality vintage tobaccos are selected from a private reserve set aside exclusively for crafting each Arturo Fuente Gran Reserva cigar, which is then skillfully hand rolled with Connecticut Shade, African Cameroon, or Ecuadorian Sun Grown wrapper leaf. These very expensive and highly sought wrapper tobaccos alter the cigars' flavor profile and strength from medium- to full-bodied. Aged in Spanish cedar vaults to peak perfection, the Gran Reserva cigars are finally ready for release to the world where cigar aficionados count them among the very finest.